Forgotten Hollywood » Blog Archive » “Forgotten Hollywood”- Rare African American Film To Shine! “Forgotten Hollywood”- Rare African American Film To Shine! A rare, untitled 1913 silent film is the subject of a new exhibit at the Museum of Modern Art in New York. 100 Years In Post-Production: Resurrecting A Lost Landmark of Black Film History tells the story behind the production. The piece of celluloid features Bert Williams, one of the era’s famed entertainers, and the first Broadway star. He performed in blackface on stage, and did the same in films. But, this romantic comedy contains a large cast of black actors. The movie was never produced in its time; its seven reels of negatives were locked away by the Biograph Film Studio. The Museum of Modern Art claimed the reels in 1938 as part of its founding film collections. The negatives were inside a cache of almost 900 film canisters donated by Biograph when it closed and donated its vaults, and MOMA made the first print from the film in 1976. The museum gave the orphan movie a working title — Bert Williams: Lime Kiln Field Day — for the exhibit and November screening, when it will be shown as part of the museum’s annual festival of film preservation. The name is taken from one of the sources for the film’s narrative, a stage routine based on a fictional Afro social club, called the Lime Kiln Club. 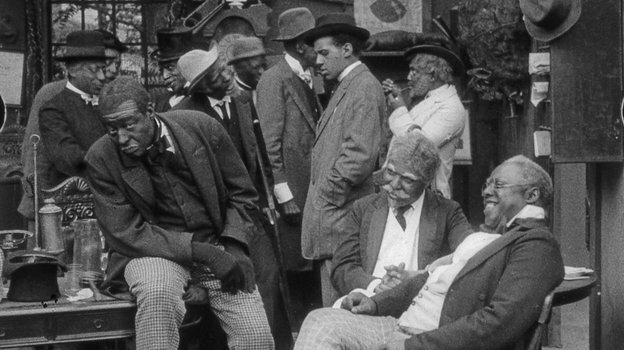 The black characters are shown in scenes of play and leisure — rare for motion pictures of the time. It’s a stunning contrast to the depictions of greedy and violent stereotypes shown two years later in Birth of a Nation, D.W. Griffith’s controversial cinematic masterpiece. MOMA curator Ron Magliozzi says the theater conventions of the day required one performer in a black musical to don blackface, while the rest of the cast could perform without makeup. This film follows the convention of the time, with Williams wearing blackface. His performance is comic, but not buffoonish; he is a romantic lead and he gets the girl at the end of the picture. Magliozzi hopes the flick will now be liberated. He hopes its future will include film festivals and come out as a DVD. The exhibit runs through March 2015. This entry was posted on Monday, October 27th, 2014 at 12:12 am	and is filed under Blog by Manny Pacheco. You can follow any comments to this post through the RSS 2.0 feed. Responses are currently closed, but you can trackback from your own site.